Paul is giving Gail a foot massage and they talk about Nina. She says she's a nice lady and Paul says he hasn't seen her for four years. Gail says she got the impression that Nina wasn't to delighted to see Paul and asks what happened between them. Paul says they went out for a while whilst he was on the airline. Gail wouldn't have known about it as she wasn't on the New Zealand run, besides she didn't like him then! Gail says she'd like to get to know Nina better and asks if Paul has any objections to having her over for dinner. Paul says he'd like to catch up with Nina and hear what she's been up to. Des is trying to cheer up Bouncer, he won't eat and he doesn't want to go for a walk. Des thinks it's because Mike has gone out with Jane and tells Bouncer that's what happens when a man is in love. The doorbell rings and its Mrs Mangel. Bouncer runs to her and she gives back his lead. Mrs Mangel asks Des to see that Bouncer gets plenty of exercise. When she leaves Bouncer tries to go with her. Des: You're not right in the head dog. Fancy loving that old bat. Harold and Henry are still arguing about David's new look. Madge refuses to get involved. David emerges from his bedroom dressed in his old attire and glasses. Henry is shocked and tells David he's let him down. David says this is how he's comfortable and doesn't want to change. Henry says that's fine, so long as he's happy. Helen is planning to go home the following day but she is still limping around. Jim tells her he wants her to move back in. Helen tells him she loves her flat and likes living alone. Jim tells she spends half of her time at the house so she may as well come back. He tells her they miss her and need her. Des puts Jamie in the pram and prepares to take he and Bouncer for a walk. The doorbell rings and its Mrs Mangel. She's come round to give Bouncer his food dish. Des says he hopes he'll eat out of this one. 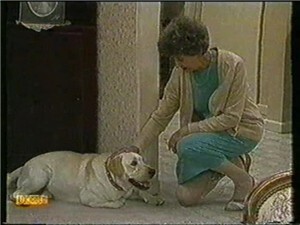 Mrs Mangel is upset to hear Bouncer isn't eating and Des thinks it's because she spoiled him. Mrs Mangel tells Des that she must go as Reverend Sampson has loaned her an organ so she can practice, she is soon to play for the soloists. As she leaves Bouncers waves and cries for her. Gail, Nina and Amy are walking across the bridge to Lassiters. Nina asks what prompted Pauls career change and Gail asks her to come to dinner so they can catch up. Gail asks Amy to look out for Jamie for her. Nina is reluctant to come to dinner and Gail tells her not to feel awkward; she knows about she and Paul and it doesn't bother her. Nina makes excuses and leaves. Jim is still trying to convince Helen to come home. She says she likes her privacy too much to sacrifice it. Jim tells her the house is almost empty during the day and as he has decided to spend more time at the garage it will be like that for a while. Helen says she will think about it but won't promise anything. Gail is having lunch when Paul arrives. She tells him Nina has started to act strange towards her. She says they hit it off yesterday but since she has found out that she is Paul's wife she doesn't want to know. Gail asks Paul if he's told her everything about their relationship. Paul says he has and doesn't see any reason why Nina would hold a grudge. Paul says he'll ask Nina if he sees her, if there's something bugging her then he wants to clear the air. Des arrives and tells Harold that Mrs Mangel is lonely. He wonders if there is any chance they could be friends again. 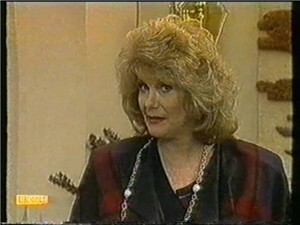 Harold tells her that Mrs Mangel tried to poison David's mind against Madge and for that he can't forgive her. Des tells him that Mike has taken Bouncer back and Harold says it's a shame as Mrs Mangel was very fond of him. 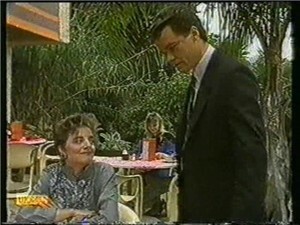 Harold admits he misses Mrs Mangel but if she wants to be friend she has to make the first move. Des: Isn't there something about forgiving trespasses? Mrs Mangel is playing her organ when she hears a noise. She opens the door and finds Bouncer. She lets him in and realises he has escaped through the fence again. She says she should take him back but a little visit won't hurt. Awwwwww. Harold and Madge are waiting for David to say goodbye to Mrs Mangel so they can drive him from the airport. Harold says maybe they should make amends with Mrs Mangel as she's poor and lonely. Harold tells Madge that he is doing a solo at church on Sunday and Mrs Mangel has to accompany him on the organ. Madge asks if he can get out of doing the solo as he's her husband and she expects him to stand by her. Paul finds Nina and Amy outside The Coffee Shop. Paul asks her why she turned down Gail's dinner invitation. She says they simply have nothing in common anymore. Paul asks her what's been happening in her life and she tells him she left the airline, started her own business and had a baby. She tells him that she and Amy's father had no future together so she decided to go it alone. It was the best decision she ever made and she's getting married in a few months time so Amy will have a proper father. Paul asks Amy how old she is and she replies that she's 3 and a half. Nina swiftly picks her up and leaves. The drawing that Amy was doing falls on the floor and Paul picks it up. Me thinks some maths calculations are running through his head right about now. Henry has come home to say goodbye to David. David thanks him for everything and presents Henry with a tie. He tells him to drop into Adelaide if he is ever passing. Harold and David leave for the airport whilst Henry pops on his tie and does his last David impression! Paul approaches Nina as Amy plays on the swings. Paul tells Nina that he's been thinking; they broke up 4 years ago and Amy's 3 and a half. He asks her if Amy is his daughter. Nina gets up and goes to leave but Paul stops her. He says he just wants to know if he's right. She doesn't deny anything and says Amy is hers and what does it matter to anyone else.